The iconic Prestige Group launches its novel residential depiction named as Prestige Kew Gardens, coming up at Yemalur in Bangalore. It is a mid-stage development project which shall be ready for possession by Jan 2020. The property is being built up with utmost care using latest and top quality construction materials & techniques. The magnificent development shall extend across 15.74 acres of massive land area and will offer 2 BHK, 2.5 BHK & 3 BHK residential apartments spanning from 615 sq. ft. to 1607 sq. ft. in area. There are 979 units in all in the complex, accommodated into 16 low-rise blocks having 4 floors each. The apartments have anti-skid tiles in the balconies, vitrified tiles in rooms, granite kitchen counter and many other comforts for residents. 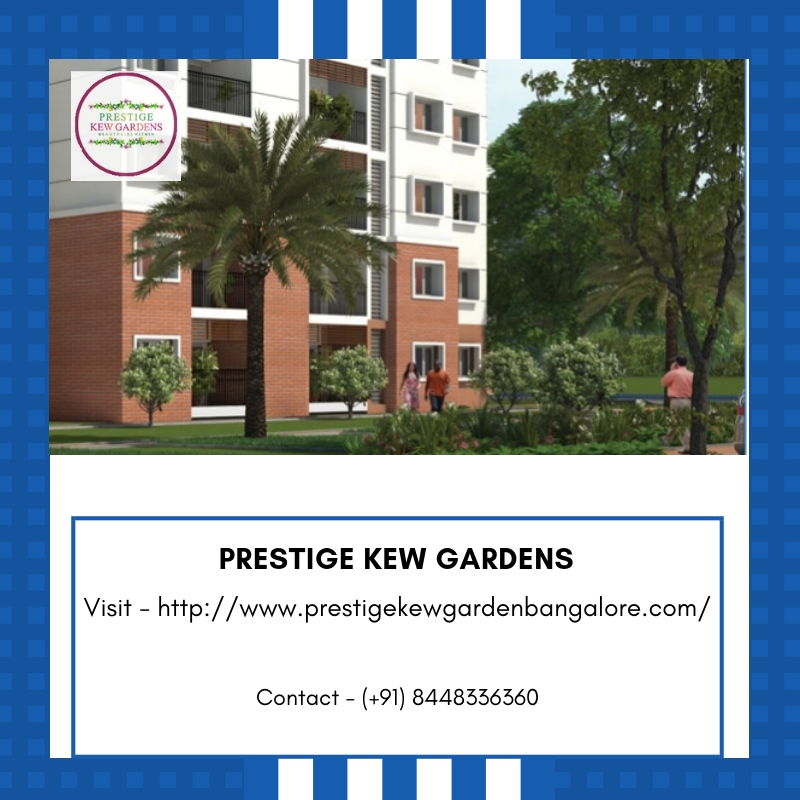 The awe-inspiring development Prestige Kew Gardens Bangalore is dotted with an array of facilities that allow you to live a relaxed and carefree life. There will be squash court, well-demarcated play area for children, swimming pool, multipurpose hall, mini theater, gym, clubhouse, meditation centre, sports facility, shopping centre, 24-hour power & water supply, ample car parks, professionally trained maintenance staff for the upkeep of the property, and peripheral CCTV coverage for the safety of the residents. Prominently coming up at Yemalur, in Bangalore, the property enjoys easy accessibility to MG Road, Outer Ring Road and several other important transits. The place is easily approachable by fast and convenient means of transports and has important places like super-speciality hospitals, banks, schools, colleges etc. available in close proximity. It is close to the major IT hub, CBD and proposed metro station at Kundalahalli station. 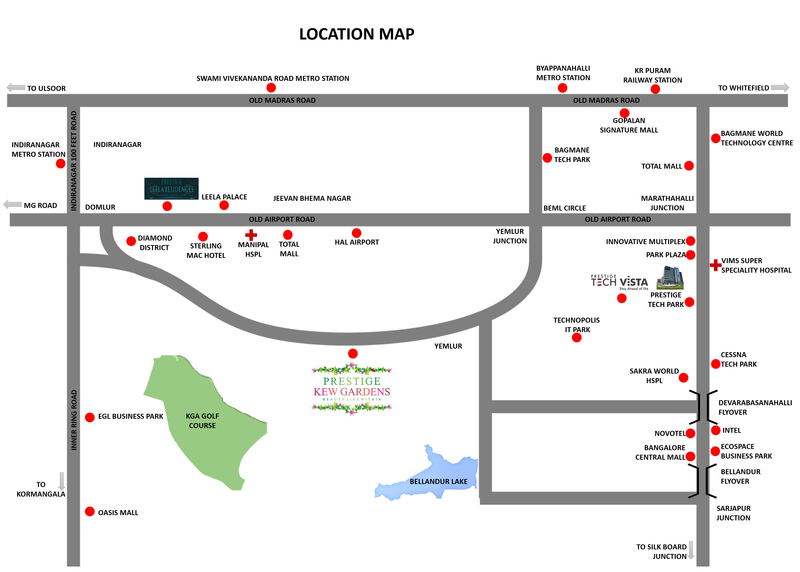 The project site is 10 kms away from MG Road and 45 kms drive from International Airport. Prestige Kew Gardens price list starts at Rs. 41.20 Lakhs - 1.07 Crs., supported by smart and possession linked payment plans. The buyers and investors can choose from the different home loan options offered by leading banks and NBFC’s. 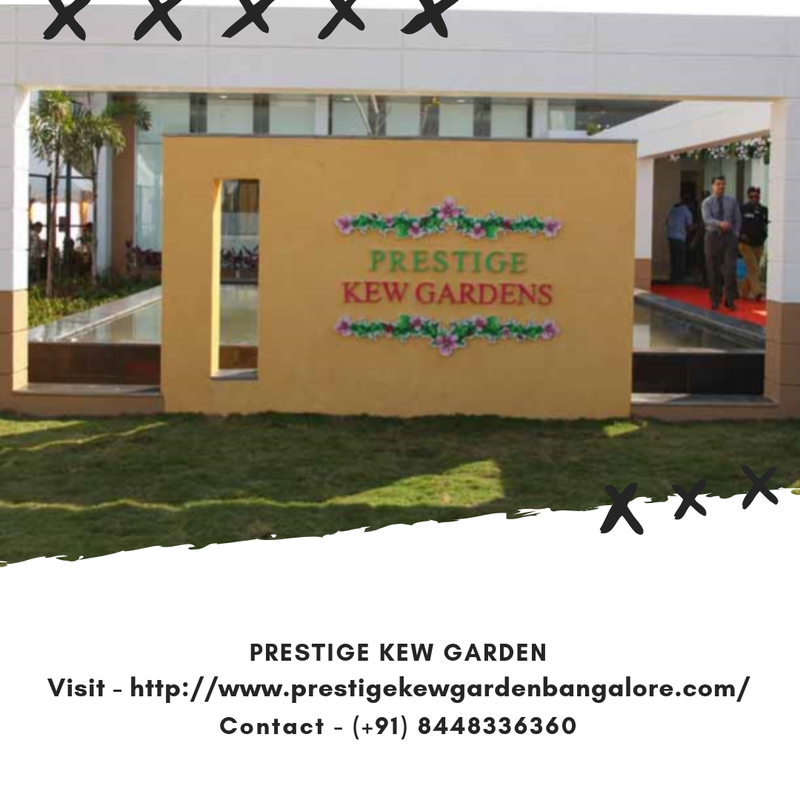 Prestige Kew Gardens is a stunning residential project developed by the famous Prestige Groups in Yemalur, Bangalore. The complex is wonderfully picturesque, full of greenery and colours of nature. The development is built over a huge 15.74 acres of land with 979 units. Prestige Kew Gardens Yemalur offers 2, 2.5and 3 BHK apartments with different configurations. The development is equipped with modern conveniences that offer a luxurious lifestyle to its residents. Some of the key features of the development are a multipurpose hall, swimming pool, 24-hour power and water supply, separate area for kids and many other facilities. The property is also located in a convenient place from where important places and landmarks are easily accessible. The home enthusiast will love the plethora of amenities present in the development. Prestige Kew Gardens promises a life of comfort and luxury that home seekers always desires. Hence, Kew Gardens by Prestige Group is a profitable investment option that assures huge returns on the investments made. For all those who aspire to live in their home of dreams, the property is a golden opportunity that should not be missed. Located at Yemalur, Off Old Airport Road, Bangalore.